The temperature has certainly dropped, hasn’t it? And now most of us can’t wait until we open the front door, flop down on the sofa, have a delicious meal, followed by a glass of wine or two. We deserve it after a long day, right? But if your home is still clinging onto the days of summer, and is looking a little drab, why not switch things up? Making your home super warm and wonderfully cozy is a lot easier than you might think! Need a little inspiration? Don’t worry! Here are five tips that will help you create a cozy home this winter. Did you know that house plants are actually good for your general health? It’s true! By adding a couple to your home you can help purify the air you breathe and even reduce the stress you’ve been feeling after a long day. If you’re stuck for a little plant inspiration then check out this website , or if you’re worried about having to keep something else alive through the winter months, then go and get some plastic ones instead! You’ll be amazed at the difference a good set of curtains can make to a room. Even a beautiful set of blinds can make a difference. You can get curtains in every color of the rainbow and you’ll probably find that you have an endless choice of patterns and textures to choose from. If you invest in a pair of lined curtains, then they’ll help keep in the heat in even more this winter. 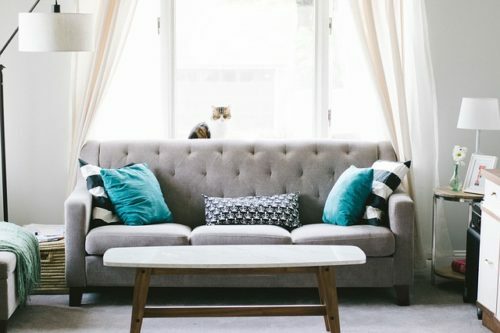 You might have a gorgeous carpet in your living room or a beautiful hardwood or laminate, but if you want to give your home a comfort boost then try layering things up with a new rug. Under the coffee table, in front of the TV or the fireplace, a new rug can make a home cozy. You could also add a new one in the bedroom or hallway. If you’re feeling super adventurous, then you could always break out the paintbrushes and get decorating. It doesn’t even have to be a whole room, but you could easily create a feature wall by painting it a warm color. Hues from red to yellow, including tans and browns, are the ones you need to look out for. You can transform a room in an instant! The nights are darker now and the mornings, too! So if you invest in your lighting a little, then you’ll certainly amp up your comfort and also make the early mornings a little more bearable. A change of light fixture will certainly make an impact. Just opt for soft lighting rather than overly bright. And never underestimate the power of tea lights and candles. You can put them everywhere or choose battery operated ones if you don’t like the idea of a naked flame in your home. And who said fairy lights are just for Christmas? Twinkly lights in a soft warm white glow will add plenty of comfort and style, drape them over mirrors, door frames, even the TV units.